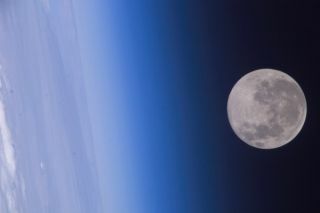 The Google Lunar X Prize, a $30 million private race to the moon, has named a new chief. Space science veteran Alexandra Hall will oversee the Google Lunar X Prize as its senior director, the X Prize foundation announced today (July 11). Hall is the co-founder and former CEO of Airship Ventures, a company that uses zeppelins for passenger flights, science research and media purposes. She also served as executive director of the Chabot Space & Science Center in Oakland, Calif.
Hall has a degree in astrophysics from the University of Leicester in the United Kingdom. She has written books about space for both children and adults, and she hosted the BBC Television show "Final Frontier." "Alexandra has proven to be a leader and entrepreneur in the aviation and space industries," said Robert Weiss, vice chairman and president of the X Prize Foundation, in a statement. "Her breadth of experience and passion for space exploration are key to attaining our goal of igniting this new and exciting race to the moon." The Google Lunar X Prize expires whenever all prizes are claimed (or, failing that, at the end of 2015). Twenty-nine teams are currently in the race. Hall said she is happy to be onboard. "I believe that solving today's global challenges requires us to think beyond that which is just outside our window," Hall said. "Potential solutions to the many problems close to home exist with the development of resources in space."